In a new wave of socially and environmentally conscious planning, Barcelona is taking back its streets from cars. The plan will convert up to 60% of the streets from road to green spaces, bike paths, and a boardwalk for pedestrians. 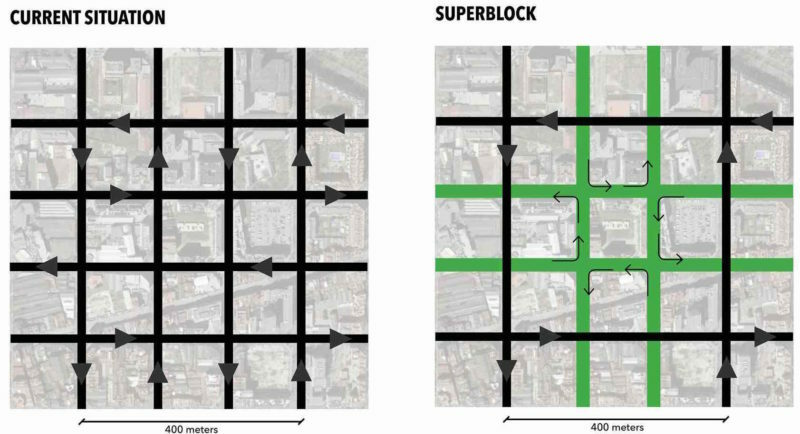 To begin, a square of 3×3 city blocks of the Eixample district will be closed off to cars (with the exception of those who live on the block and drive, who will be able to continue at very reduced speeds), creating a 9-block “Superblock.” This will mean more space and quiet for residents to actually live — with greenery, room to walk and cycle, and recreational space that has the possibility to make the neighborhood a more social environment. While the project will cost about €10 million, these changes also address two important issues facing the city — air quality and noise levels. Air quality that has fallen below the standards set by the European Union could be linked to 3,500 deaths per year and almost 19,000 hospital visits in Barcelona. Noise levels within the city are also thought to be well above healthy standards. Naturally, road accidents are also expected to be reduced. In these ways, the developments not only benefit the residents of the specific neighborhoods and blocks in question, but will benefit residents citywide. Though, as we’ve seen in Salt Lake City and Washington, D.C., neighborhoods improved by public transportation options and biking infrastructure also see positive economic effects for local businesses and real estate. For a city that has always been revered for its architecture and cityscapes, it’s exciting to see that it is still making bold changes. Other cities, take notice. What happens where the green lines intersect with the black lines. And what about delivery vans.